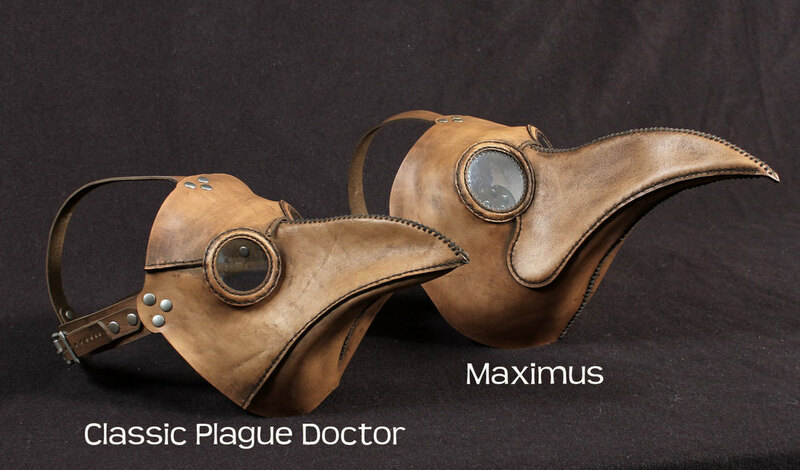 We offer a wide selection of plague doctor masks as seen in this side-by-side comparison, from fancy steampunk at upper left to simple beak mask in lower right. 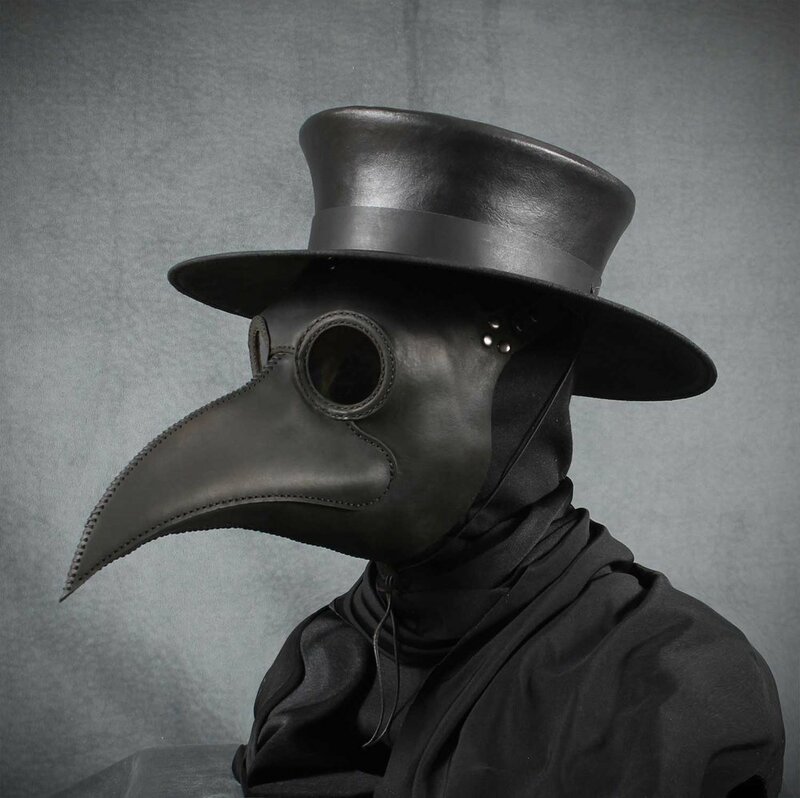 A plague doctor (Italian: medico della peste, Dutch: pestmeester, Spanish: médico de la peste negra, German: Pestarzt) was a special medical physician who treated those who had the plague. 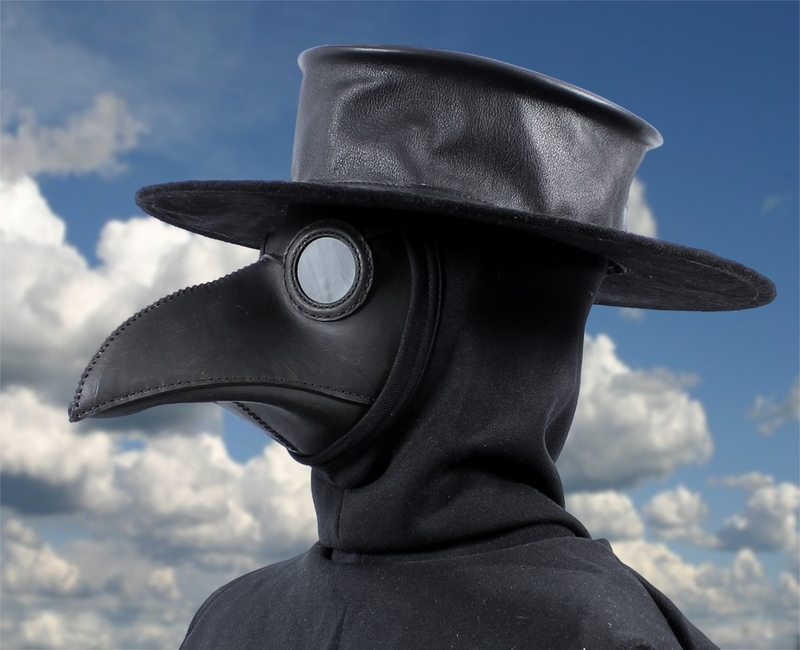 They were specifically hired by towns that had many plague victims in times of plague epidemics. Since the city was paying their salary, they treated everyone: both the rich and the poor. They were not normally professionally trained experienced physicians or surgeons, and often were second-rate doctors not able to otherwise run a successful medical business or young physicians trying to establish themselves. 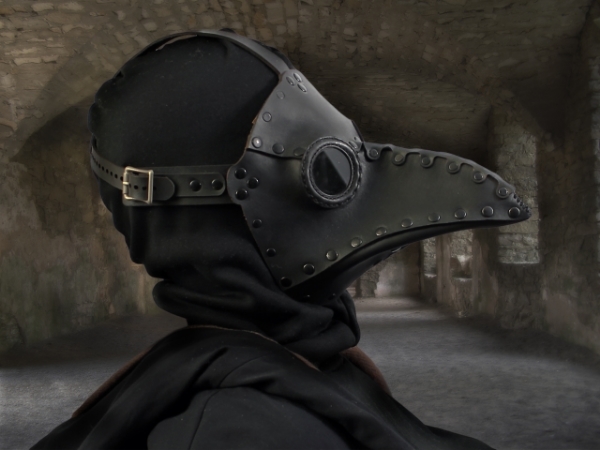 Plague doctors by their covenant treated plague patients and were known as municipal or "community plague doctors", whereas "general practitioners" were separate doctors and both might be in the same European city or town at the same time. 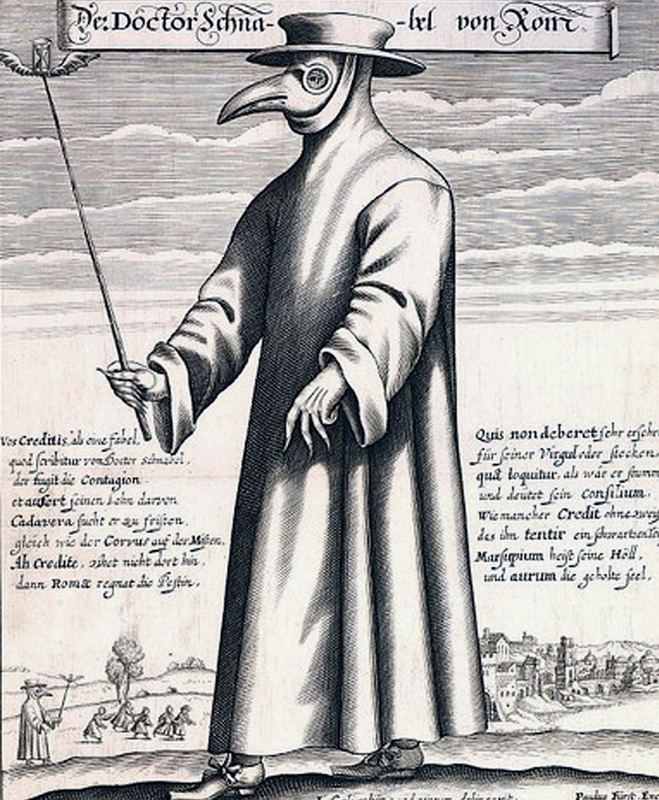 In France and the Netherlands plague doctors often lacked medical training and were referred to as "empirics". 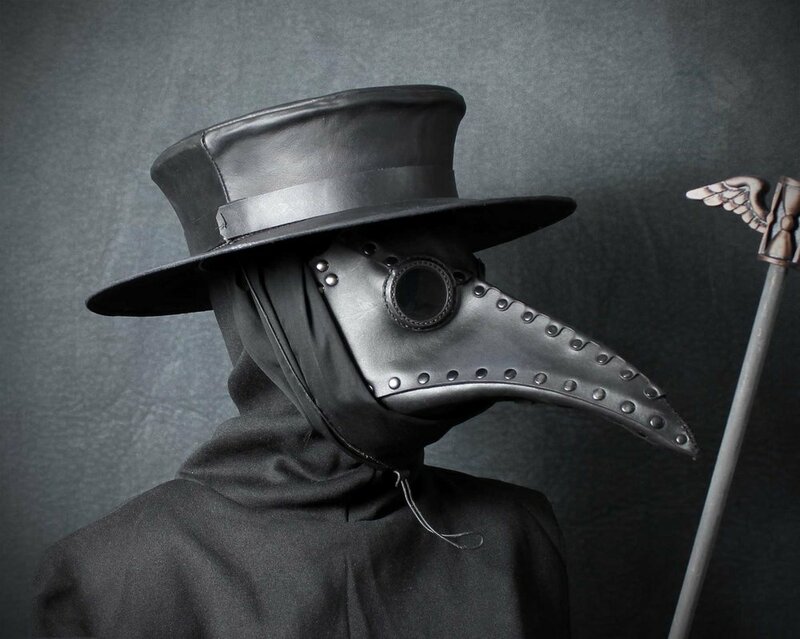 In one case a plague doctor had been a fruit salesman before his employment as a physician. 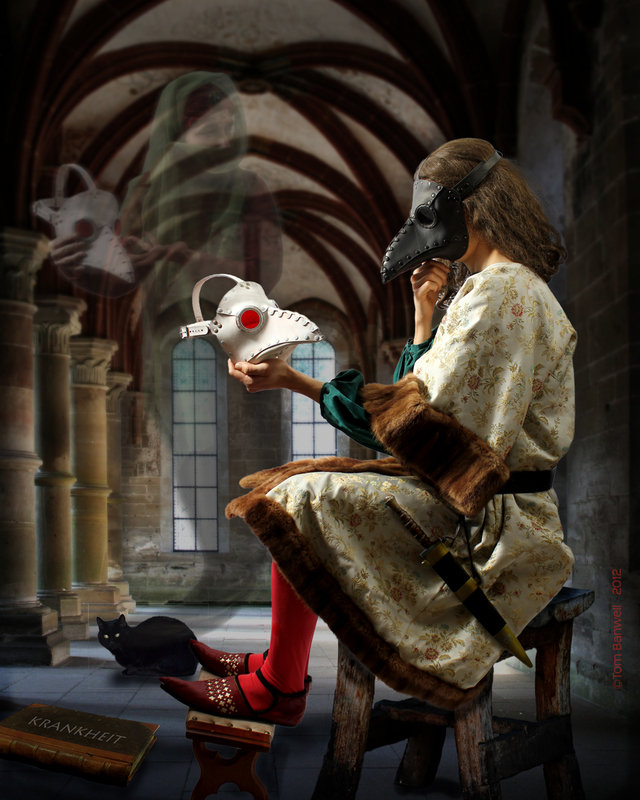 "The nose half a foot long, shaped like a beak, filled with perfume with only two holes, one on each side near the nostrils, but that can suffice to breathe and to carry along with the air one breathes the impression of the drugs enclosed further along in the beak. Under the coat we wear boots made in Moroccan leather (goat leather) from the front of the breeches in smooth skin that are attached to said boots and a short-sleeved blouse in smooth skin, the bottom of which is tucked into the breeches. The hat and gloves are also made of the same skin… with spectacles over the eyes." 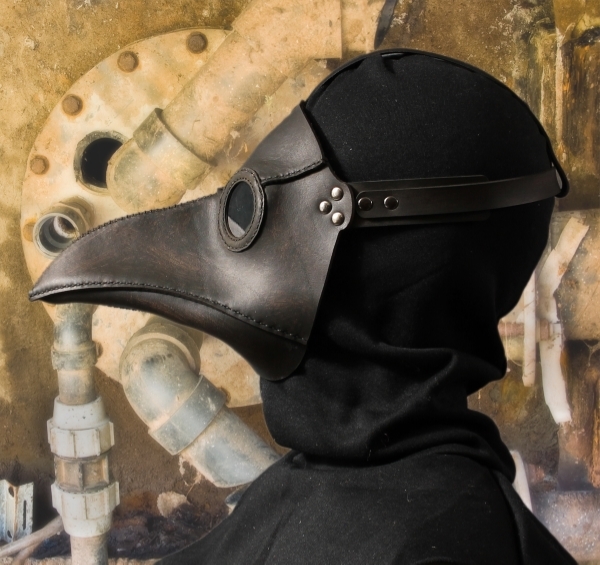 At Tom Banwell Designs we currently make twelve versions of the plague doctor mask: Maximus, Classic, Schnabel, Krankheit, Jackdaw, Stiltzkin, Corax, and Pestis, including four steampunk versions, Dr. Beulenpest, Miasma, Ichabod, and Icarus. The Classic I first made in 2010, and is based on both the engraving by Paulus Fürst done in 1656 in Rome, as well as a leather reproduction mask in the Steno Museum in Aarhus, Denmark. The Classic is all hand-stitched and has a 6" long beak. The leather is the finest top grain vegetable tanned cowhide. The eyepieces have acrylic lenses which are sewn in place. The mask has an adjustable strap around the back of the head that fastens with a buckle and is attached to the mask with rivets. There is also a strap that runs across the top of the head to make it easier to wear. The only change I made to this model from the original designs was to move the eyepieces toward the front of the face so that the wearer can actually see out of them. We make the Classic in Brownish Tan with clear lenses, Antique Black with gray lenses, and White with red lenses. 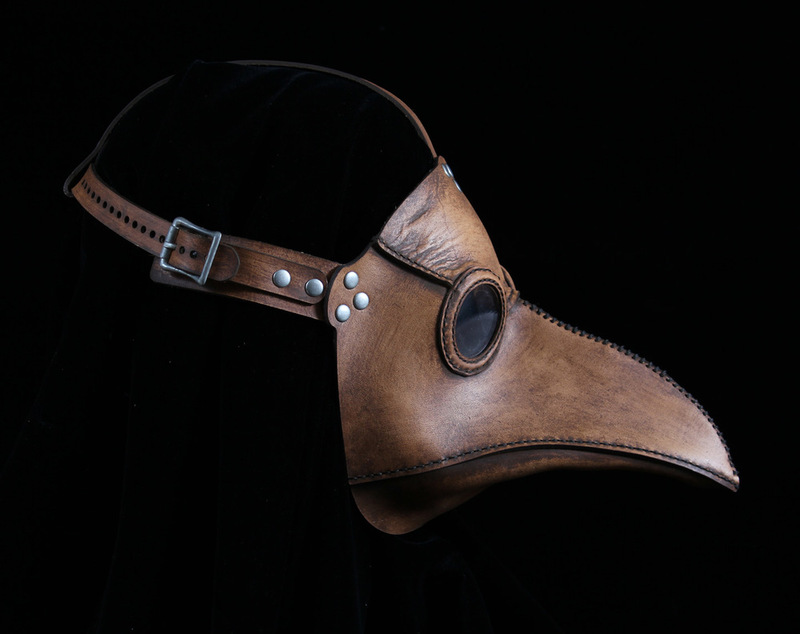 After receiving many requests for a less expensive plague doctor mask I came up with the Krankheit. It is virtually identical to the Classic except most of the hand-stitching is replaced with rivets. In addition, rather than brushing antiquing solution onto the leather to obtain the color, we apply paint with an airbrush. By making these two changes we are able to construct the Krankheit mask in considerably less time. Krankheit comes in Brownish Tan with gray lenses, Black with gray lenses, and White with red lenses. This black is a true black rather than the Classic's antique black. 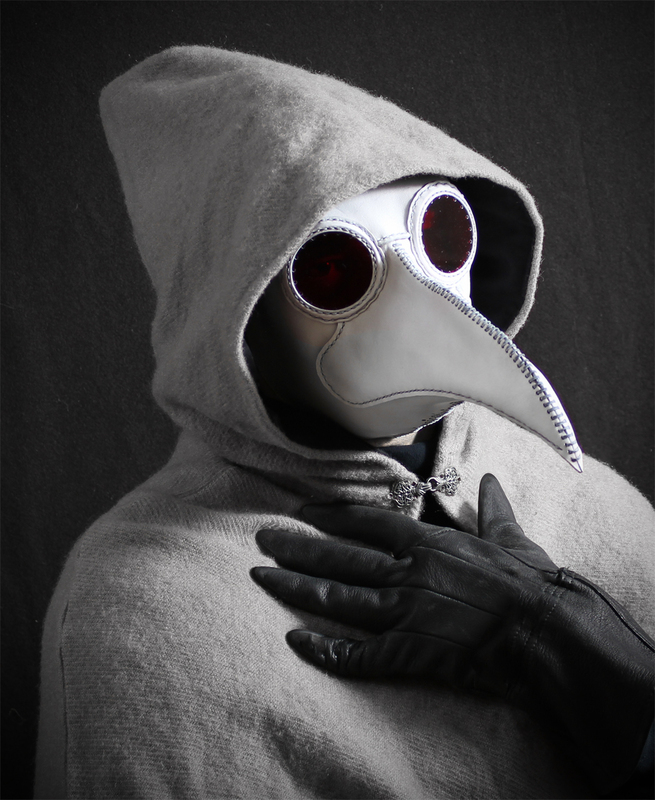 I was unable to design a way to insert the eyepieces without stitching, and still wanting to make a plague doctor mask that would be less expensive I decided to make a version without any eyes at all. In other words it would be the beak but without the eyes or forehead. 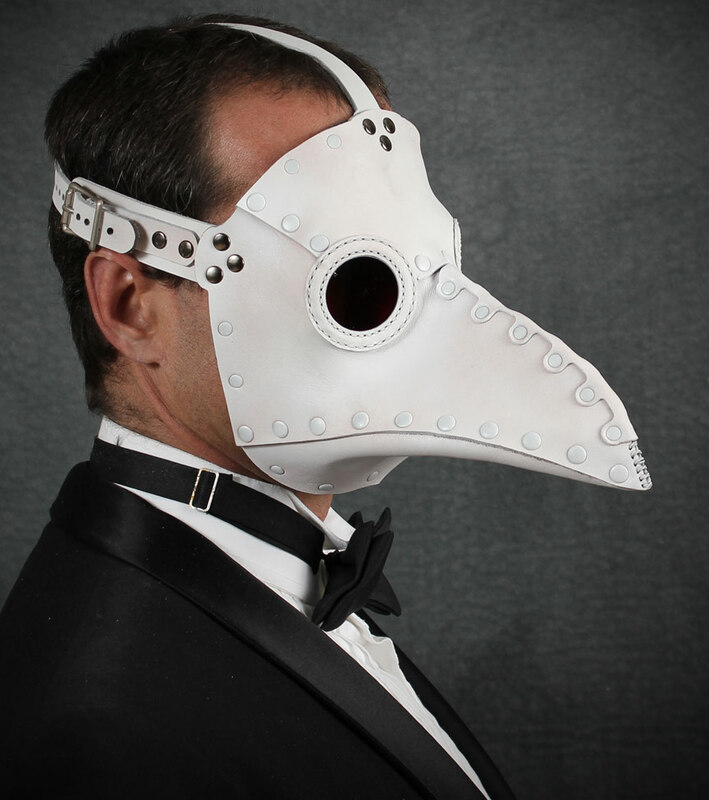 Thus was born the Pestis mask. It can be worn by itself or coupled with goggles or dark glasses. It also works well for individuals who wear prescription glasses. 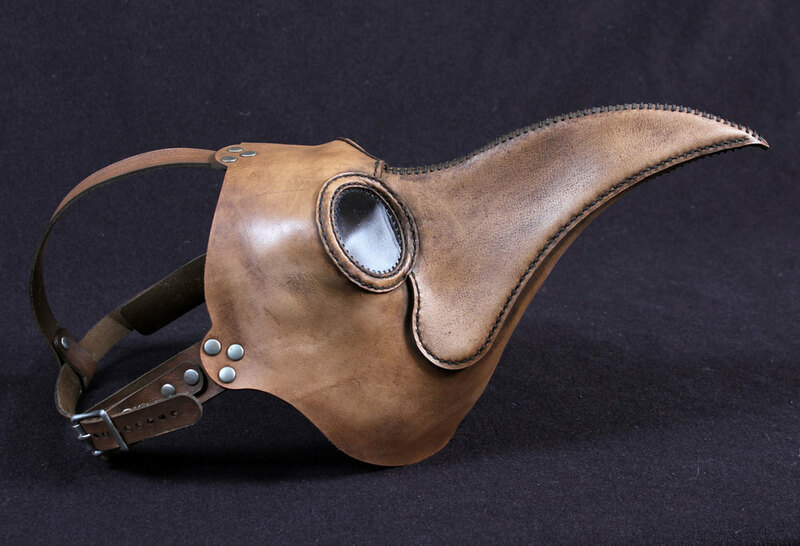 Pestis has the same 6" beak as Krankheit, and is riveted together. Rather than a leather strap with buckle it has a ¾" wide black elastic band. It is available in either Black or White, and comes with a neoprene foam pad on the bridge of the nose. 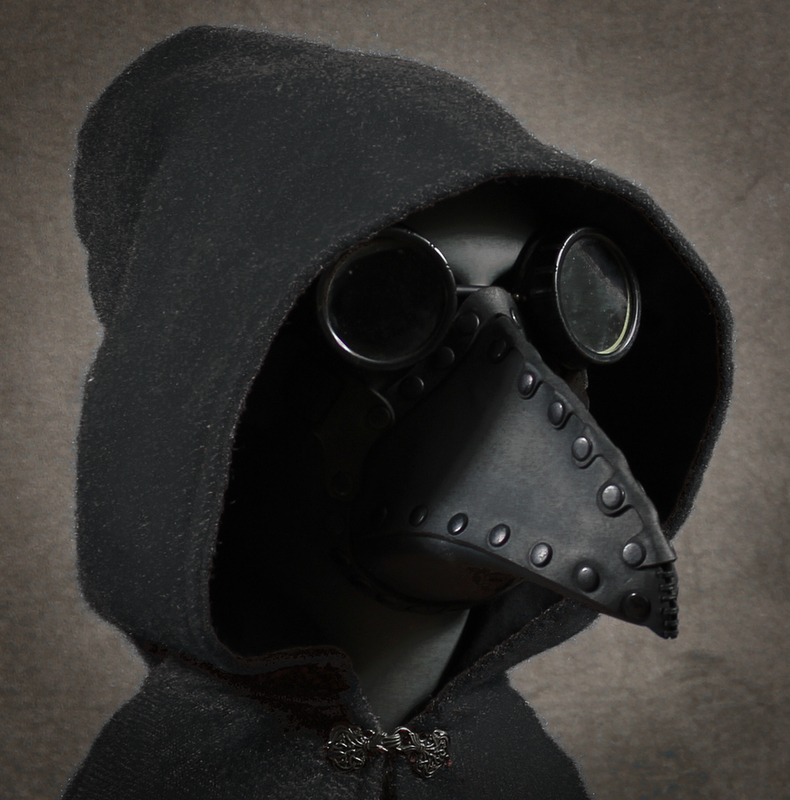 I had received a couple of requests for a plague doctor mask with a longer beak, so I designed the Schnabel. 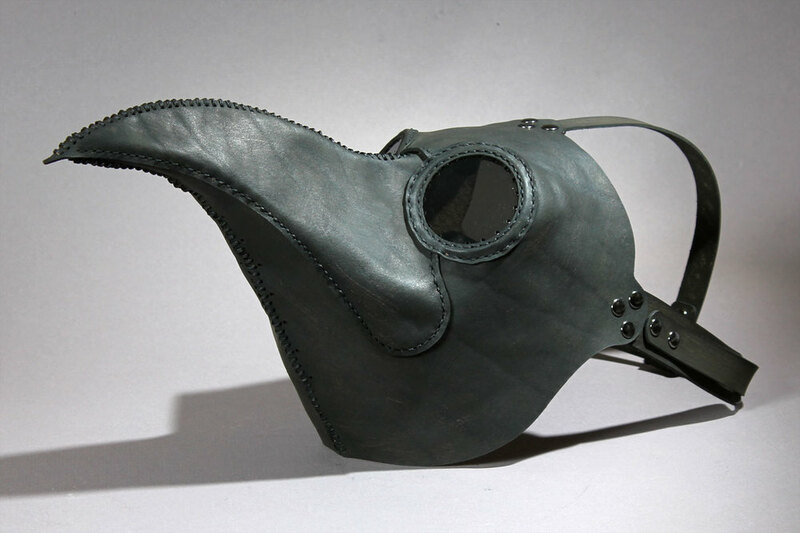 It is essentially the Krankheit mask but with an 8½" long beak, which is 2½" longer than the other versions. It is made of the same top-grain vegetable tanned leather with stitched-in acrylic lenses and leather straps and buckle. 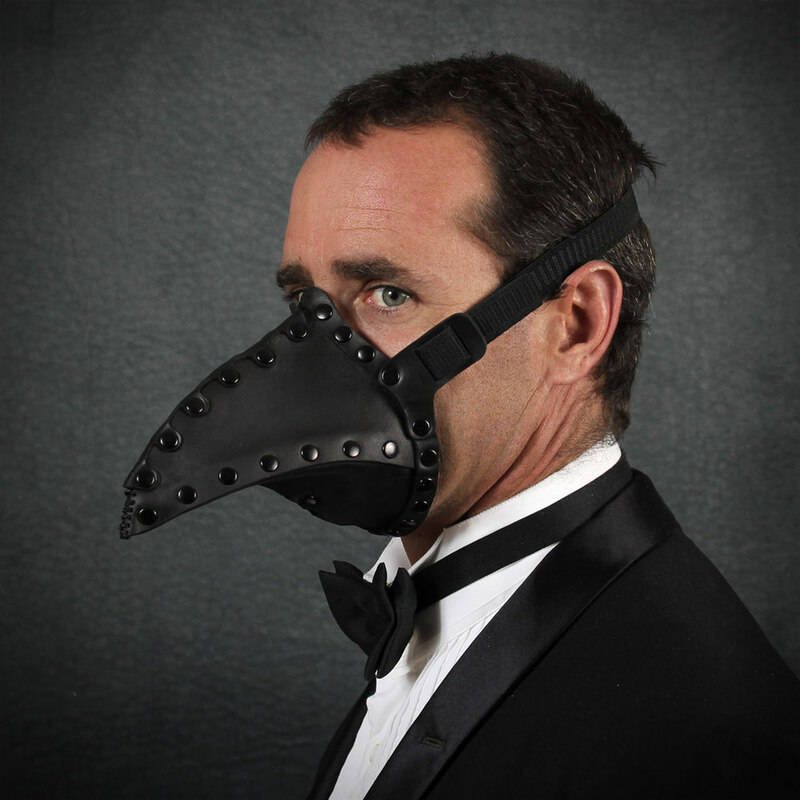 It comes with a series of nine ventilation holes on the bottom of the beak for ease of breathing. It will fit most adult heads up to 24" around. The paint is designed to wear off of rivets to give it that aged look. We offer it in Black with gray lenses and White with red lenses. 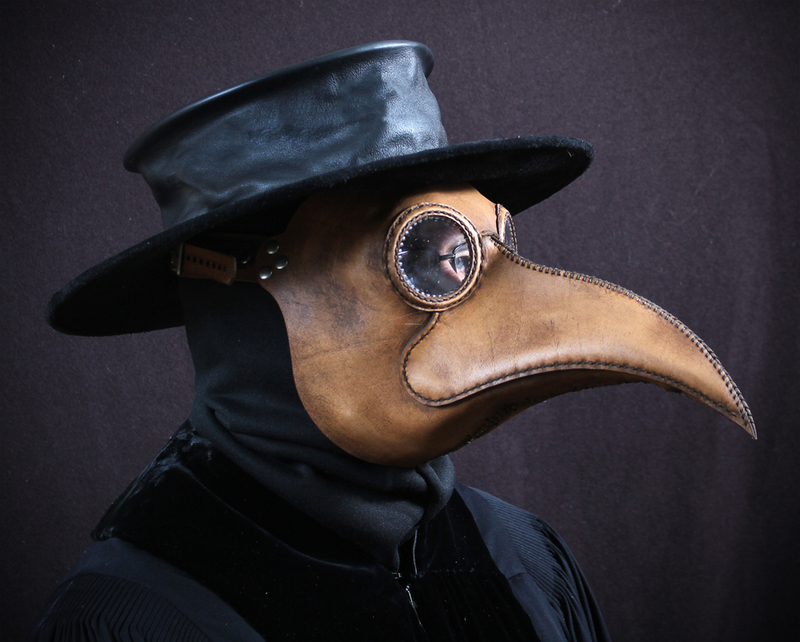 None of the plague doctor masks that I've mentioned so far can accommodate eyeglasses, except for Pestis. I had also been wanting to make another mask with the antiquing solution, which gives a very rich, old look to the piece. So I came up with Maximus. The lenses sit further away from the eyes, allowing room for eyeglasses. The lenses are larger so that the viewer can still see out easily. And the mask is all hand-stitched (like the Classic), except for the straps. It also comes back further on the face, and so is an overall larger mask, well suited to those with larger heads. 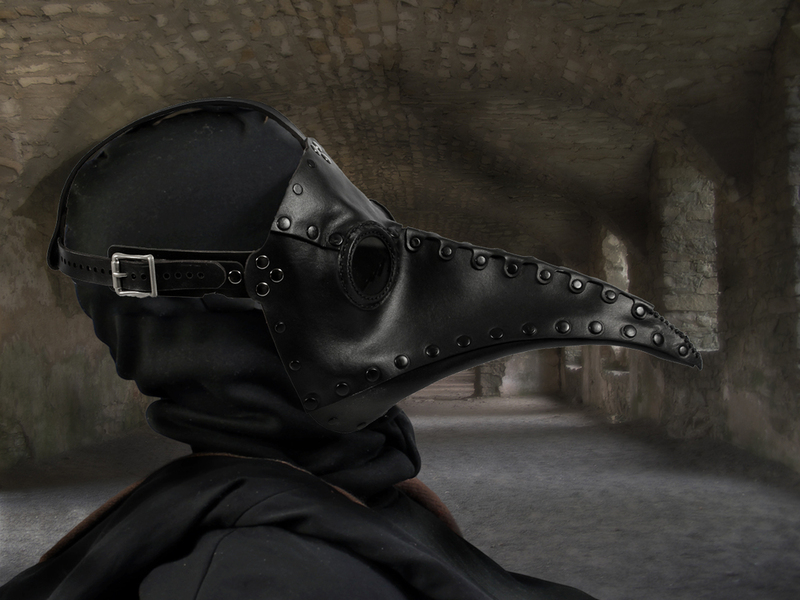 Most recently I took the Pestis mask and elongated the beak and named it Corax (which means crow). 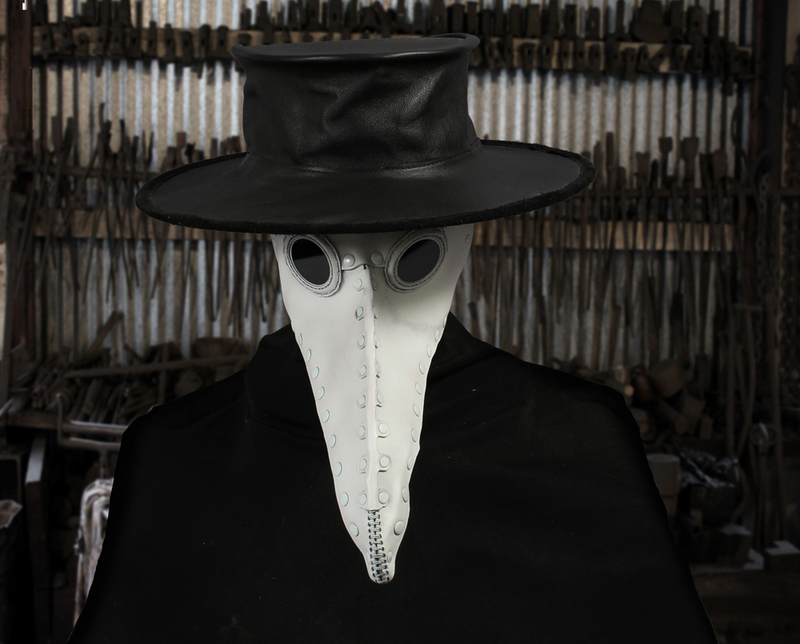 Unlike most of our other plague doctor masks this version doesn't cover the eyes. It can be worn with goggles, or prescription glasses, or with the eyes left uncovered. I also brought the sides of the mask back closer to the ears. 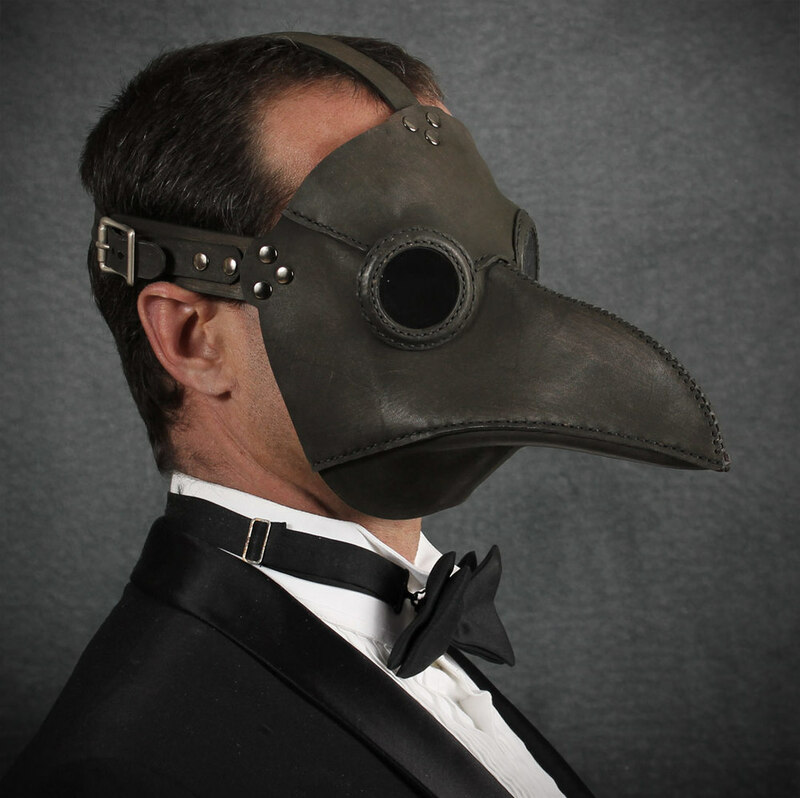 The mask is made of medium weight veg tan leather and has an adjustable elastic strap. It will fit most adult heads up to 24" around. The edge going over the bridge of the nose has deerskin binding for comfortable wear. There are a series of ventilation holes on the bottom of the beak for easy breathing. We make it in both Black and White. 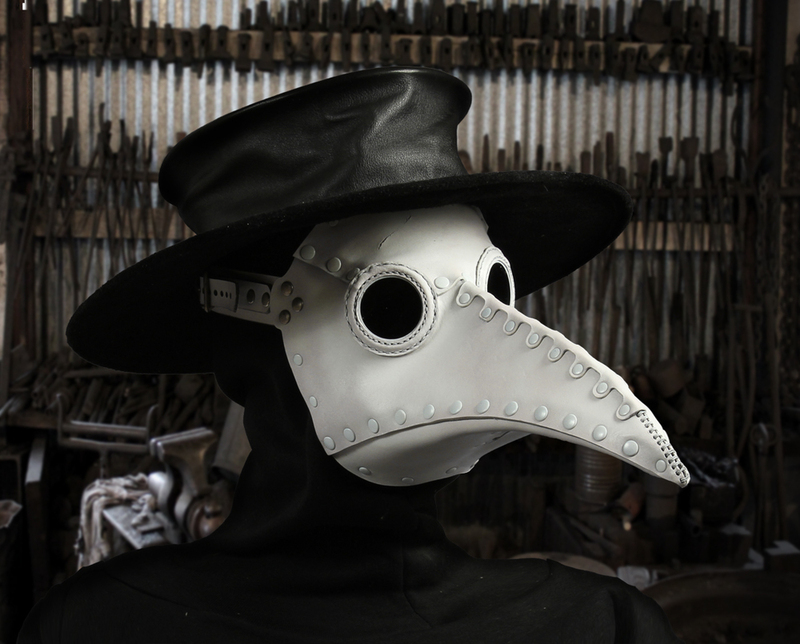 Click through to see a gallery of plague doctor masks.